LEN - www.lankaenews.com | ‘Changes effected are all anti constitutional and against lofty Parliament traditions . Until majority is proved I shall accept only the previous legal position !’ Speaker issues official red notice ! 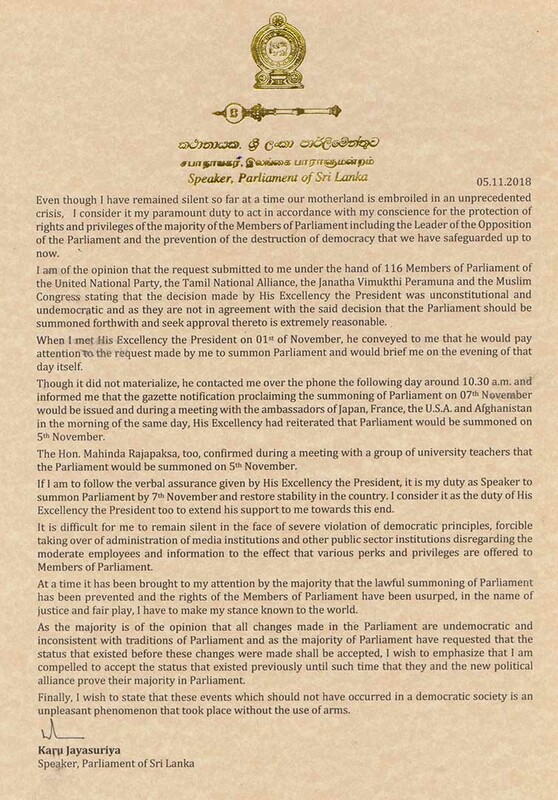 (Lanka e News -07.Nov.2018, 5.30PM) The Hon.speaker Karu Jayasuriya has once again issued a strict and stern order under the laws via a communique that the controversial changes which were effected in Parliament during the recent past are all outrageously anti constitutional and running counter to parliamentary traditions. It is a universally known fact that the president made a solemn promise not only to the speaker and the foreign countries that the Parliament will be reconvened on the 7 th , but again changed the date breaking his promise .Yesterday ,after advancing the date by two days (earlier 16 th) he issued a gazette notification that the parliament will resume sittings on the 14 th. It is following these multiple breach of promises by the president the speaker was compelled to issue the latest communique. Hon. Speaker’s official communique is appended . Even though I have remained silent so far at a time our motherland is embroiled in an unprecedented crisis, I consider it my paramount duty to act in accordance with my conscience for the protection of rights and privileges of the majority of the Members of Parliament including the Leader of the Opposition of the Parliament and the prevention of the destruction of democracy that we have safeguarded up to now. I am of the opinion that the request submitted to me under the hand of 116 Members of Parliament of the United National Party, the Tamil National Alliance, the Janatha Vimukthi Peramuna and the Muslim Congress stating that the decision made by His Excellency the President was unconstitutional and undemocratic and as they are not in agreement with the said decision that the Parliament should be summoned forthwith and seek approval thereto is extremely reasonable. When I met His Excellency the President on 01st of November, he conveyed to me that he would pay attention to the request made by me to summon Parliament and would brief me on the evening of that day itself. Though it did not materialize, he contacted me over the phone the following day around 10.30 a.m. and informed me that the gazette notification proclaiming the summoning of Parliament on 07th November would be issued and during a meeting with the ambassadors of Japan, France, the U.S.A. and Afghanistan in the morning of the same day, His Excellency had reiterated that Parliament would be summoned on 5th November. The Hon. Mahinda Rajapaksa, too, confirmed during a meeting with a group of university teachers that the Parliament would be summoned on 5th November. If I am to follow the verbal assurance given by His Excellency the President, it is my duty as Speaker to summon Parliament by 7th November and restore stability in the country. I consider it as the duty of His Excellency the President too to extend his support to me towards this end. It is difficult for me to remain silent in the face of severe violation of democratic principles, forcible taking over of administration of media institutions and other public sector institutions disregarding the moderate employees and information to the effect that various perks and privileges are offered to Members of Parliament. At a time it has been brought to my attention by the majority that the lawful summoning of Parliament has been prevented and the rights of the Members of Parliament have been usurped, in the name of justice and fair play, I have to make my stance known to the world. As the majority is of the opinion that all changes made in the Parliament are undemocratic and inconsistent with traditions of Parliament and as the majority of Parliament have requested that the status that existed before these changes were made shall be accepted, I wish to emphasize that I am compelled to accept the status that existed previously until such time that they and the new political alliance prove their majority in Parliament. Finally, I wish to state that these events which should not have occurred in a democratic society is an unpleasant phenomenon that took place without the use of arms.